Shueitai will bundele on Morisawa’s Passport. Dai Nippon Printing Co.,Ltd. 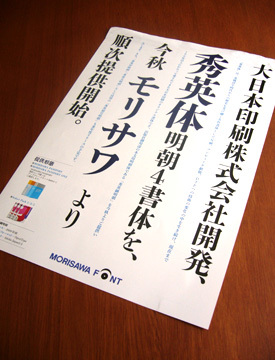 announced that Shueitai 秀英体 Ming-cho font family will be available to use with Morisawa’s Passport program. For a starter, Shuei Hoso Ming-cho (Light weight) will be released with Passport in this Autumn, and the rest of the Shuei Ming-cho family, Chuu Ming-cho (Regular), Futo Ming-cho (Bold) and Shuei Shogo Ming-cho （秀英体初号明朝） will be released in 2010. Normal family suite pack will be also released from Morisawa. Dai Nippon Printing, abbreviated DNP and is the largest printing company in the world, has been revised its exclusive font series named Shueitai to release as a retail font, and at last, decided to collaborate with Morisawa for providing Shueitai font series. Shueitai is known for one of two origins of Japanese typefaces, the other is Tsukiji-tai, which has been exclusively used for the products that DNP printed such novels, magazines, dictionaries, packagings and digital contents for over one hundred years. Shueitai is known as an exclusive font for a long while, but, in fact, DNP already licensed Shueitai to the photo-typesetting maker Shaken few decades ago, which could be widely used for design works, especially publishing field. So designers who were familiar with Shueitai with photo-type setting would like to use them as digital fonts. To answer that request, DNP started the project called Heisei no dai kaikoku 平成の大改刻, means ‘The revival project for Shueitai in Heisei period’ in 2006 to revise Shueitai family for release into public as retail fonts. 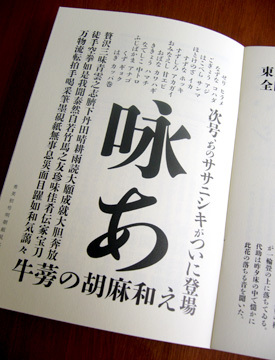 Left: Morisawa’s leaflet for Shueitai. Right: DNP provided the catalogs and specimen sheets of Shueitai family to visitors to the business show, Tokyo Digital publishing fare to be held at Tokyo Big Site from July 9th to 12th. Inside of the small specimen book in the above right photograph. Left: Shueitai Shogo Ming-cho’s Kanji characters. Right: A composition Shuei Shogo Ming-cho’s Kanji and Kana. Shueitai has really handsome and classical typeface design. It contains Ming-cho (Serif), Gothic (San serif) and Maru-Gothic (Rounded), each style has two or three weight. 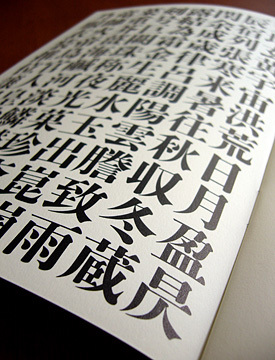 Ming-cho style’s (serif style) Kana has Calligraphic strokes. Especially Shuei-Shogo-Ming-cho, is a Display Heavy style, keeps sequences of the strokes to emphasize the handwriting stroke forms like East Asian style Calligraphy. On the other hand, Kanji has also dynamic strokes, and I hope you take a look at the detail of the outlines of straight strokes, you’ll be able to find they are not straight but smooth and slightly curved, which gives Kanjis an enriched image and much beautiful impression. I also would like to show you about what the Passport is. Morisawa’s Passport program is annual license system. It is available to use all of fonts which are included in DVD media by paying license fee (¥52,500 includes consumer tax.) every year. The Passport DVD contains over 350 fonts, not only full Kanji and Kana fonts but also Kana fonts for swapping Kana part of Japanese fonts. This license system is very useful and helpful for users who want to have a lot of fonts at once because it takes about 10,000 yen to 30,000 to buy an average full Japanese retail font. 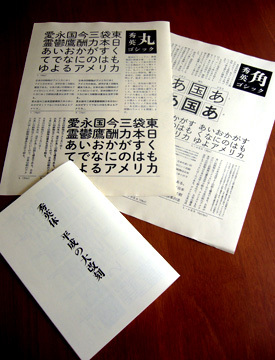 To collect all of fonts covered several kinds of styles, it will take over a few million yen. I can’t afford to buy them! 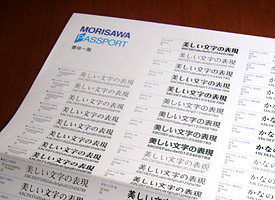 Left: Moriswa Passport Font Library Poster. You can use all of the fonts in this poster. Right: Fontworks LETS catalog and specimen book I’ve got last year. If you think Japanese fonts are too expensive, I recommend you consider to try Morisawa’s Passport or Fontworks’ LETS license system. In Japan, an annual license font system is getting popular among designers in recent years. 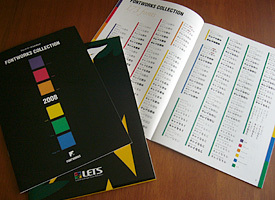 Fontworks inc. is the first provider to start the annual license program known as LETS, Leading Edge Type Solution, in 2002 before Morisawa started Passport program in 2005. Then, some of font vendors followed using similar annual license system. TypeBank and Iwata provided their fonts with LETS. Not only Japanese type foundry but also Housei, mainly deals with Chinese fonts, and JIKJISOFT, is a Korean company, also provides fonts with LETS. Related article: Visiting the show room of Shueitai typeface.